A few days ago, I had the honor to attend the Collet Champagne Dinner at Flemings Prime Steakhouse created by Chef Pedro Anzardo. There is nothing I love more than a nice bottle of French bubbly for celebrating. 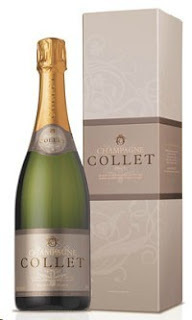 We did just that - toasted our many glasses of Collet Champagne to my acceptance into the 2013 ING New York Marathon. We were welcomed by Collet Champagne's Jeff Bevan, CEO Champagne Collet USA, Bertrand Glory, International Commercial Director and Sebastien Walasiak, Chef de Cave. After a small history lesson on Collet, which you can read about here, we were served our first pairing. Duck Escabeche - red quinoa salad, rainbow baby beets, wild berry and honey vinaigrette, paired with Collet Brut Champagne France NV. I loved this salad, it was very earthy which paired well with the Brut which was 20-25% Chardonnay, 25-30% Pinot Noir, 50% Pinot Meunier. Upon first sip, both Gabe and I were instantly impressed with Collet Champagne. This was his favorite of the 4 champagnes of the evening and we were both very excited for what was ahead. Our second course was presented in fun way - Icelandic Cod, chorizo, seafood medley brandade served in a giant clam shell. The cod was perfectly flakey and this dish was paired with an amazing glass of Brut Champagne Grand Art France. The Grand Art is 40% Chardonnay, 40% Pinot Noir and 20% Pinot Meunier. It had the perfect mix of fruit and bubbles and this was my favorite of the four champagnes served this evening. Our third course was huge - huge in flavor and huge in size. Veal Osso Bucco, shiitake and oyster mushroom risotto, crispy yuca. The Veal was a bone in shank which meant one thing - bone marrow! I was the only one at the table overly excited over this and got looks from my dinner companions. It was delicious and this risotto was one I would die trying to perfect at home. 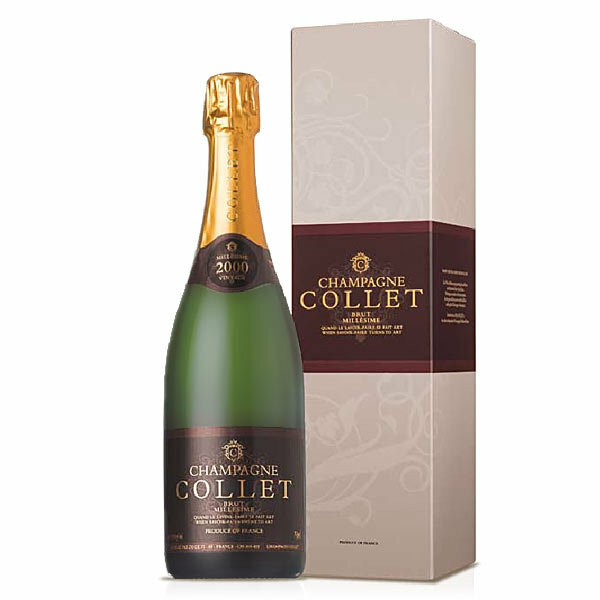 Served with a 2002 Collet Brut Millesime Champagne, France. A stunning blend of 45% Chardonnay and 55% Pinot Noir. These grapes were all harvested in the same year. Our fourth and final course was a Rose Sabayon, strawberries, mint foam, lemongrass. This light dessert was the perfect ending to our dinner. 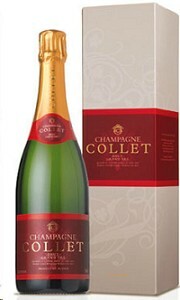 It was paired with Collet Demi-Sec Champagne, France. 50% Pinot Meunier, 30% Pinot Noir, 20% Chardonnay. We want more, We want more, Like, you really like it, ya want more.! If you thought the evening was over, you are wrong. We were surprised with a champagne sabre by Sebastian Walasiak. This 3 liter bottle of Grand Art was presented in fine form and I caught it all on film for your enjoyment. Kids - don't do this at home.After the successful Sabre, we helped drink the giant 3 liter bottle. At the end of the night, we left full of amazing food while being introduced to a new French Champagne, which will be our go-to for celebrations. We were both overly impressed with Collet Champagne and look forward to our next sip. Flemings Tampa offers this type of event frequently so make sure you sign up for "Friends of Flemings" to keep in the know! Sounds like a really awesome dinner! I love the cod served in the clam shell - such a cool presentation. Super neat right! It was a nice time for sure. Why wasn't the chef, Pedro Anzardo, mentioned? Regardless if he was in the video, he should get a mention at the very least for creating such a wonderful meal. Thanks for the comment....I updated the post with Chef's name.